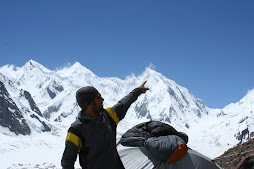 Gender equality dream expedition was organized by Karakorum Expeditions to Spantik peak, the team compromised on three New Zealand and two Pakistanis, the team of members led by Mirza Ali,the team started from Islamabad on 14th of July .due to Bad weather the party left on the Karakorum High way toward Skardu. After two days of rest in Skardu,the team met with HP’s and cook staff,after briefing at the tourist information center skardu, the team left for Arandu, the team arrived Arandu valley, where the team hired porters and headed up for the base camp, weather seemed to be very good and hot the first two days of the camp,then the rain starts from Balocho ,that stopped to travel to base camp as the rain start pouring down. When the weather little improved the next two days, the team marched up to base camp, this was amazing feeling and great experience for the new comers to the base camp. Having rest for two days, the team started acclimatization, reached camp 1 in five hours and back to base camp after setting up the tents. It was pretty quick return climb, this section of the mountain is more dry and rocky, the Kiwi friends enjoyed this part of the mountain, we did the hike up to camp 1 in normal trekking boats. Returning to base camp, then Imran the cook boy got high altitude sicknes,the rain was pouring down ,when HP’s and the cook took Imran back to Balocho in heavy rain. The weather turned bad for a week that stopped our progress on the mountain. When we got weather window, the team again started their climb, the time was running out and this time, the team had planned to stay until summit push. Established camp 1 on 27th july then 28th camp II ,Samina got neck muscles strain at camp I and told to go down. The other members went to camp II, the next day, the team rest at camp II. The HP’s tried to put on CampIII,but that night the weather was very cloudy and the snow remained soft and was not firm to climb. Due to deep snow the HP’s deposit the Camp III materials half to camp III. When I reached camp II , the members wanted to go back to base camp, to look after Samina’s neck,since one of the Team member was nurse by profession. The team got back to base camp the same day and that was a very long decent for elder women. By now the time was running out. And the team decided to call off the expedition. The HP’s went to close the high camps. With our team other two expeditions called off their expeditions and though Spantik didn’t favor us, however it was a great experience.